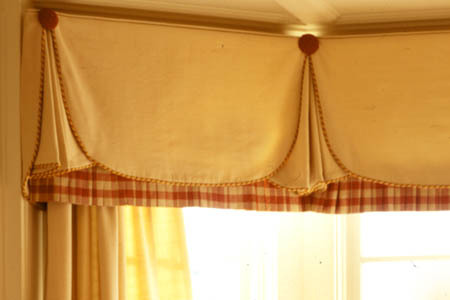 This fully lined and interlined, tailored valance with pleated underskirt can be adapted to fit any size window. The pleated underskirt can be omitted, if desired. 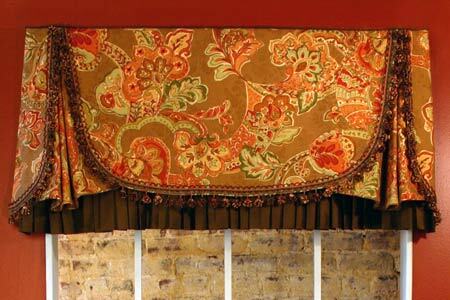 This treatment works well in a bay window. Q: How is the pleating done for the underskirt? Q: Do all of the center sections need to be the same size? I have a large wall of windows with two different size adjoining windows. Q: Is the pattern featured in Southern Lady Sept 2014 page 35 available for purchase? Q: My question is about fabric amounts. 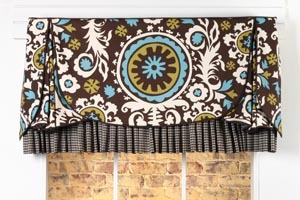 The window is 47" and the yardage requirements jump from 42" to 53-104" so how much face fabric would I need to a 47" window? Q: Can the Madelyn Valance pleated underskirt be made with larger box pleats? I would like to mimic the bed skirt which has 20" box pleats (king-sized bed). The double window is 90.5" wide. Thank you.